The 48”x 96” Racetrack Oval Glass top has a thickness of 1/2 inch. This clear glass table top is made from the finest quality furniture glass that has been tempered for added durability and safety. The racetrack oval top features a stylish 1” beveled edge and has a weight of 240 lbs. The glass table edge is carefully polished for a stunning look. Glass top tables have a variety of uses in the home and offices so it is one of the more popular items used for decorating now a days. The racetrack oval glass tops work well as a replacement glass top or to give your current dinning table a new look and feel. They also work well as a table top protector for your wood table top. The beveled edge gives it a polished look to complete your dining set. Each beautiful racetrack oval glass top comes with free bumpons that are placed between the glass and the base to protect the table beneath. Each glass table top from Glass Tops Direct is professionally packed in an individual carton with styrofoam for unbeatable protection from breakage during shipment. The 48”x 96” racetrack oval glass top will be sent quickly via FedEx or common carrier and is insured to for a safe arrival. The glass experts at Glass Tops make shopping for glass tops easy. 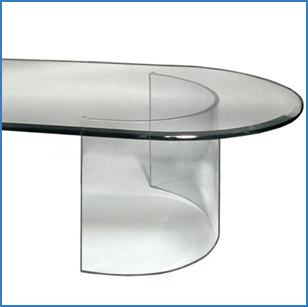 They offer a wide selection of glass tops in various shapes, thicknesses, edge work and sizes. Their inventory includes an extensive array of many other shapes for glass tops including rectangle, round, square, and even boat shaped. All of our high quality glass is fully stocked and ships immediately. 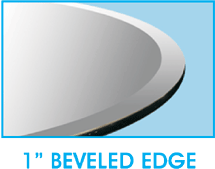 Your Oval glass top is tempered at NO ADDITIONAL COST. Tempered glass is 4-5 times stronger than standard annealed glass. Tempered glass is manufactured through a process of extreme heating and rapid cooling. Tempered glass table tops are more heat and scratch resistant than standard annealed glass.